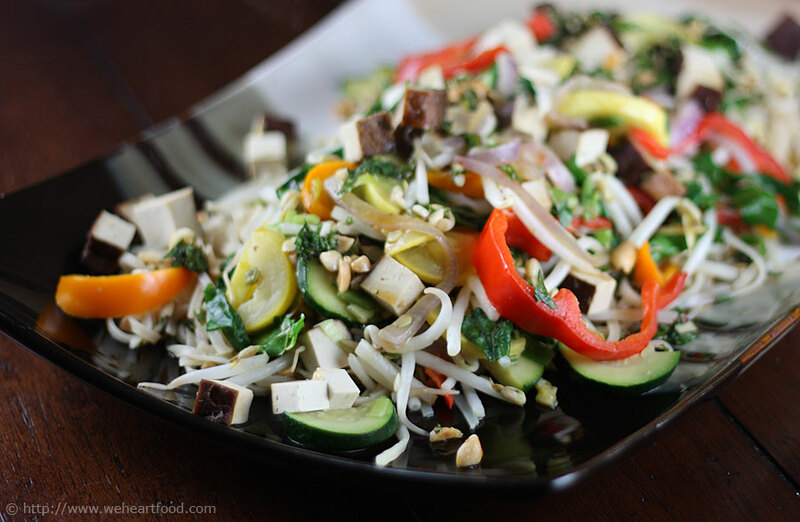 Lisa got tired of my experiments and just wanted to make a light, healthy asian-themed salad for dinner, and this one, featuring rice noodles, quick-stir-fried vegetables, and tofu was just what she wanted. The vegetables are still nice and crisp when you place them on the platter, and the entire dish is incredibly refreshing. The recipe comes from The Best of Cooking Light: Everyday Favorites. Combine mint, soy sauce, sugar, peanuts, rice wine vinegar, chiles, and garlic cloves; mix thoroughly. Pour half of the mixture over noodles in a large bowl. Heat the sesame oil in a large nonstick skillet over medium-high heat. Add squash, bell pepper and zucchini and saute for four minutes. Add the cabbage, bean sprouts, green onions, and tofu, and saute for an additional three minutes. Place the noodles on a platter, then top with the cabbage/veggie mixture.